› Consult annual reports of previous years: 2014 annual report, 2013 annual report, 2012 annual report, 2011 annual report, 2010 annual report, annual report 2009. 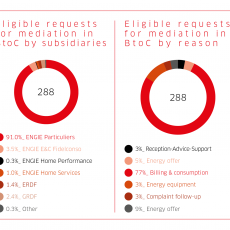 The number of mediation cases handled in the ENGIE Group has once again risen: 54% more than in 2014, up from 199 to 306, all markets and business units taken together. 94 % of these cases concern private customers (B2C) in the field of energy. At the same time, the number of requests fell sharply, down from 4,301 in 2014 to 2,588 in 2015. 81% of solutions proposed during mediation cases were accepted by the parties and implemented. Furthermore, mediation is a fairly swift and effective process, given that 68% of cases are concluded in under 60 days and 95% in under 90 days (the legal requirement – the order of 20 August 2015 in France ). Once again this year, most of the requests received concern customers’ comprehension of energy bills, regularization amounts further to incorrect meter readings or adjustments to meter readings further to meter failures. The mediation department has noted the emergence of complaints about new services. This is more particularly the case for services concerning boilers and renewable energies. 2015 is also the year that saw significant developments in the Mediation regulatory framework. The order of 20 August offered a regulatory framework for consumption mediation by transposing the 2013 European ADR directive (alternative dispute resolution) concerning out-of-court dispute resolution. 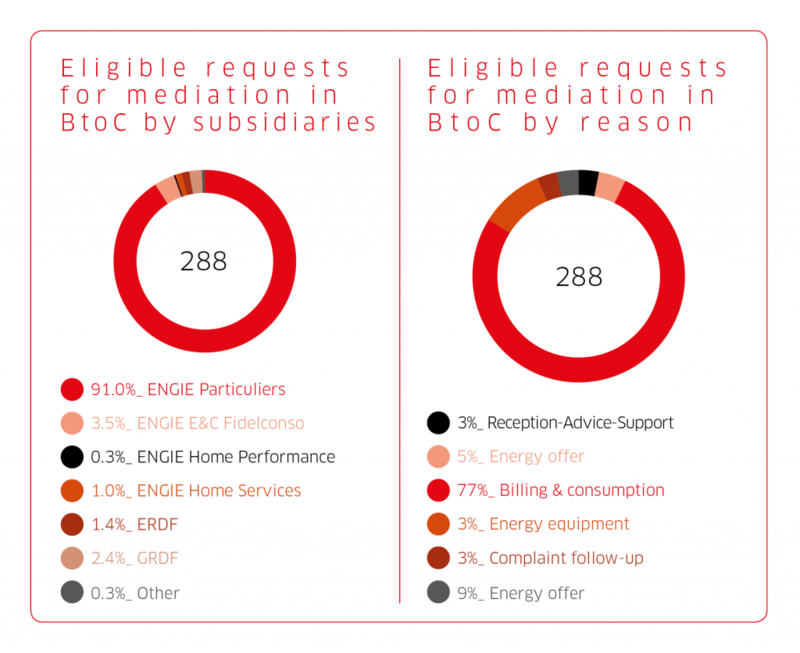 On 25 February 2016 ENGIE’s mediation service was approved by the Mediation Assessment and Regulation Commission, the Consumption Mediator and was listed as such on the European Union’s list. A distinction that confirms compliance with all the criteria of independence and efficiency laid down by these new texts. The qualities of ENGIE’s company mediation, inter alia its independence and impartiality, have therefore once again been acknowledged. On 10th June the ENGIE Group’s Mediator Jean-Pierre Hervé submitted his 2015 annual report to Isabelle Kocher, the group’s Chief Executive Officer. He noted a sharp fall in the number of requests (- 40%) “owing to better performance of the customer service”, and a sharp rise in the number of completed mediation cases (50% more than in 2014). “A trend that is accounted for in part by customers’ more exacting standard vis-à-vis their energy provider, against a backdrop of revolution in the sector, with an increasing number of offers and services”, says the press release. The average case processing time was 67 days, in line with the law, which sets a limit of 90 days. Most requests concerned customers’ comprehension of energy bills, but new claims were recorded, relating to new services, in particular those relating to boilers and renewable energies. More than 80% of the opinions delivered during mediation were accepted by the parties and implemented, whereas special cases led the mediator to make 19 recommendations. In 2015, based on the special cases he dealt with in the year, the Mediator made 19 recommendations. They were discussed with the ENGIE Group business units concerned to ensure their implementation, as well as with consumer organizations.